It is said that we eat with our eyes first but I think we also drink with our eyes. And there's something about a crisp blue cocktail served in an old fashioned mason jar on a warm spring day that just begs for a sip. 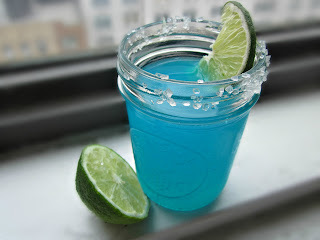 And when that blue drink is a margarita and the occasion is Cinco De Mayo it's time to drink up! The classic margarita is made with orange liqueur, most commonly triple sec. Blue curacao is also an orange liqueur and thus, blue margaritas have long been around. We find the flavor of the blue a little more bitter so we've balanced the drink by using half blue curacao and half triple sec. Add in the requisite fresh lime juice, a bit of simple syrup and the unique flavor punch of sea salt and this drink is lip-smacking good. Cheers! Prepare a mason jar or margarita glass by rubbing the rim with a cut lime and then dipping the glass into a shallow dish of sea salt until the rim is coated. Place the glass in the freezer for a few minutes to chill. Combine all in the ingredients in a cocktail shaker filled with ice and shake well. Pour into the chilled glass and garnish with a wedge of lime. i love the color of this margarita! sounds delicious! There is something about a turquoise blue drink that says bliss to me. Sadly I have not drank any blue drinks in awhile. I will need to get some curacao soon. I love the idea of using it in a margarita. You do come up with the most wonderful beverages. No doubt there will be some great drinks served up at your house for Cinco de Mayo-enjoy the weekend and cheers! Blue, purple, green, yellow...whatever! It's a margarita! I'm IN. I'll be there soon. I hope you have extra! I like the color of this margarita! Delish! Looks delish. I love blue drinks. 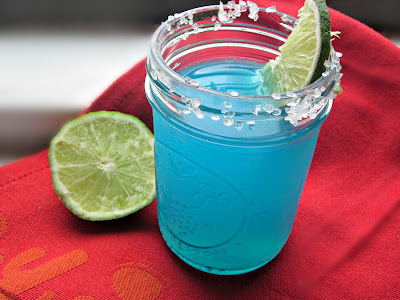 Love the idea of a blue margarita! So refreshing. You are just wooing me with these tequila-based cocktails. Love it! I have a thing for blue drinks like this one - you just know they are good! Have a wonderful weekend, Anita! Haha o no... the blue in these reminds me of these drinks we used to get in college... they were called like blue monsters or something else ridiculous like that?? I made my mom drink one on Mom's weekend.. :) Yours look much classier! And much more delicious! I love margaritas, the blue twist is so fun! I may have to make this one first! Then mix up the watermelon one!!! Yummy! Oh my gosh, this drinks takes me back to my single days... tons of fruity colorful drinks! :) Thanks for sharing, this looks so refreshing!! Such a pretty color! When I got married we experiment like crazy with blue curacao trying to create a teal colored signature drink. This would have been perfect! Finally! A blue drink that looks just right instead of sickeningly sweet. Thanks for this. Looks like a great drink to serve at a casual outdoor party. Very nice! The recipe I have is almost identical. This is the best I have found. So look forward to summer for all the wonderful drinks, smoothies and slushes. Personally, I don’t mind the taste of green drink mixed just with water. I feel that the benefits far outweigh any taste issues for me, but I know that this might not be the case with everyone.